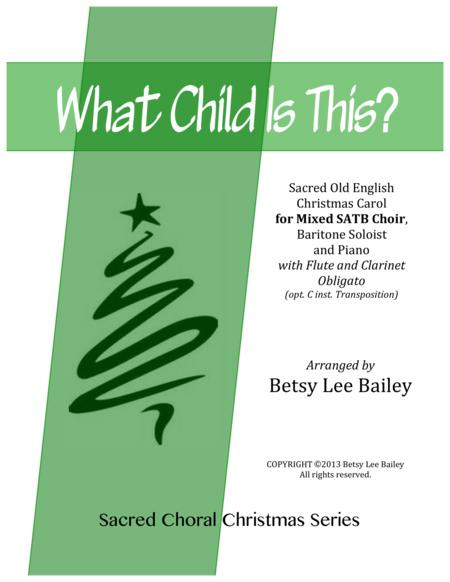 Composed by Betsy Lee Bailey. Sacred, Praise & Worship, General Worship, Christmas. Octavo. 12 pages. Published by Betsy Lee Bailey (S0.20645). 2015 Holiday Contest - "What Child Is This?" is always a Christmas favorite. This arrangement is for SATB choir, Baritone Soloist, Piano and Flute and Clarinet. The vocal parts are in easily accessible ranges for the singers, and the instrumental parts are suitable for young players.